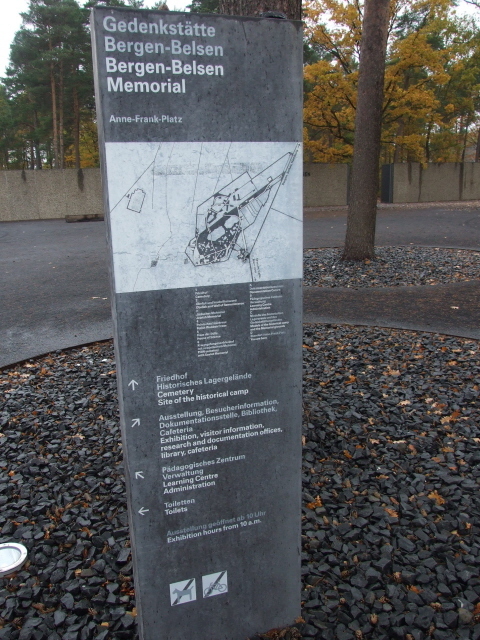 The site of a former Nazi POW & concentration camp in northern Germany – since the opening of the new documentation centre in 2007, the memorial site has finally caught up and joined the top league of such dark tourism destinations in Germany, even though virtually nothing of the original camp's structures remains. More background info: Unlike most of the other notorious concentration camps on German soil, especially in contrast to Dachau or Sachsenhausen, Bergen-Belsen wasn't actually a concentration camp until the very last phase of its existence. It was set up originally as a "mere" POW camp – and continued to serve as one right to the end too. As such it was on a par with e.g. Sandbostel. However, Bergen-Belsen was turned into a large-scale "overflow" concentration camp from 1944 when other camps closer to the frontlines (or already overrun by the Allies) were "evacuated". The camp at Bergen-Belsen was set up with the outbreak of WWII at a site that had already been used as a military training ground from 1935. Ironically, a vast area just north of the present memorial site is still being used as a (now NATO) military training and shooting range. The first POWs were from France, Belgium and Poland, but from 1941 Soviet POWs became the majority in the camp, which was officially called "Stalag 311 XI C". The Soviets, regarded as "worthless" humans, were treated in the harshest way – tens of thousands succumbed to the inhumane living conditions and perished here, an estimated 14,000 out of a total of 20,000 died in the first winter, 1941/42, alone! It was, however, in the last phase of the war that the horrors at Bergen-Belsen spiralled out of control. Other camps closer to the frontline were evacuated, e.g. Westerbork, and inmates sent to Belsen instead. Furthermore, transports from Auschwitz also arrived in Belsen. The camp became hopelessly overcrowded, with facilities unable to sustain such large numbers. The resultant diseases, cold and hunger led to a sharp rise in the death rate. Amongst the best-known names of those sent to Bergen-Belsen are Anne Frank and her sister Margot (sent here from Auschwitz), who both perished of typhoid just before the camp was liberated by the British Army on 15 April 1945. 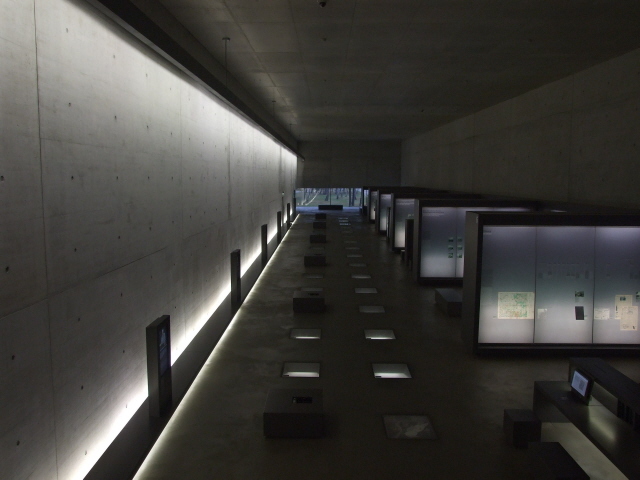 In total some 70,000 people lost their lives here and are buried in the camp's mass graves. Even after the camp was liberated, thousands still died in the weeks after, unable to recover from the hell of Belsen, in nearby army barracks. Some 55,000 prisoners were liberated. When the British finally arrived, they were as appalled by what they found (esp. those piles of skeletal corpses) as the Americans were on liberating e.g. Dachau or Buchenwald (or the Soviets even earlier, at the first liberation of a large camp, namely Majdanek). Similarly to the US, the British too immediately set about documenting the horrors on film and in photographs, and also forcing "ordinary" Germans to see the horrors for themselves and help in the clearing up of the camp and the nursing of survivors. 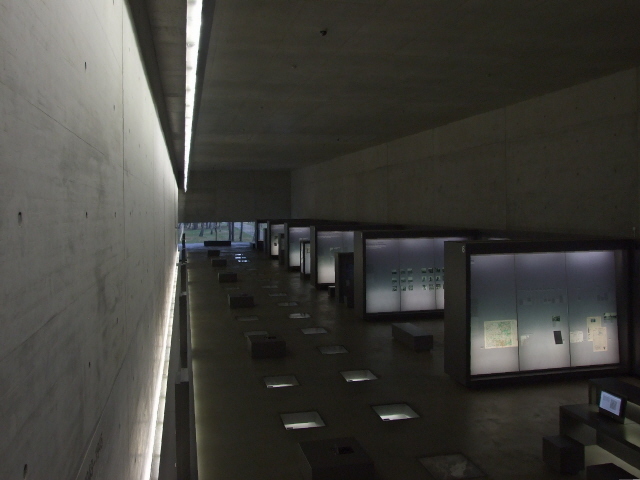 This is when some of the most gruesome footage of the camp was filmed that can now be seen at the new documentation centre. After the camp's liberation it served as a "displaced persons" camp until 1950, mainly for Polish POWs and Jews, most of whom eventually emigrated. The original buildings of the camp, however, were all demolished, partly for fear of diseases spreading from the barracks, and thus nothing at all remained of the original structures. Only in recent years, archaeological excavations unearthed a few remains of foundations of some of the buildings. Apart from the few memorials and the marked mass graves, the site remained more or less bare for decades, and became increasingly overgrown. A small museum did little to alleviate this sorry state of a memorial site of such historical magnitude. Then, from the late 1990s onwards, the development of a new, proper documentation centre was planned. It finally opened in October 2007. If it wasn't so cynical, one could say that this new museum was worth waiting for – as it is indeed excellent. Note: for the documentation centre alone a five-star rating would have been appropriate here, I only dock one star because the rest of the site is so bare and because it's so difficult to get there. What there is to see: In the main, it's the outstanding new documentation centre that makes the journey to Belsen so well worth it. Nothing of the original camp remains, however, other than a few broken foundations of a couple of former buildings. The overgrown camp area is still being cleared and more excavation work is going on. But the site will never look remotely like a concentration camp (unless it is decided to reconstruct parts of it – which currently seems unlikely, and is probably even deemed inappropriate here). There are a few memorials scattered over the sprawling former camp grounds, esp. a large obelisk dominating the site in the far western corner. There are also Jewish, Polish and Soviet memorials, the latter in the POW camp cemetery a 15-30 minute walk away outside the actual camp's perimeter. Other that those memorials (there's also a "tombstone" for Margot and Anne Frank) and the few rough relics, there are just the mass graves – stone markers say "500", "1000" or even "5000 buried here". Nothing more. The names of the victims are still being researched – many remain nameless to this day. Given the scarcity of authentic relics and the state of the memorial site in general, which had more or less been neglected for decades, the task of constructing a proper documentation centre/visitor centre was a particularly tall order. But the designers rose to the challenge. The result is indeed impressive. If wasn't such an inappropriate word in this kind of context, you could even say that visually alone the new centre is a "stunner". Perhaps less so from the outside, but the aesthetics of the design of the interior are an awesome success, in my opinion. 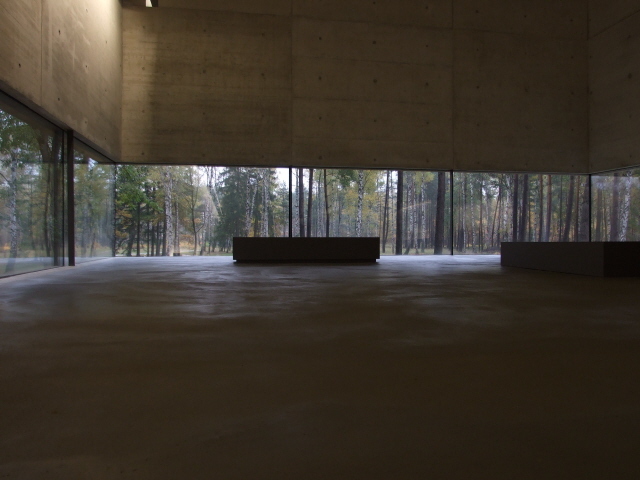 The long walls and ceilings are all bare, grey, polished concrete, exuding a cold and sober atmosphere that is totally in keeping with the story told in the exhibition as such. The structure of the exhibition too follows an exceptionally well-thought-out design, with a clarity of forms and layout that is quite fascinating as such. This is particularly true for the main and largest section of the exhibition at its far end. 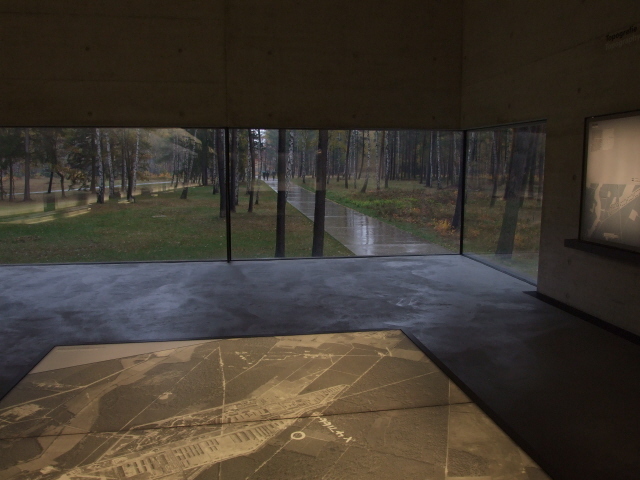 It's basically a long high-ceilinged concrete corridor, windowless on the sides, but which ends and almost "opens up" at the rear wall with large panoramic windows that allow an 180 degree view of the camp's grounds beyond, with a map of the former camp aiding orientation. This section at the far end of the building also hovers a couple of feet over the ground outside, which only underscores the "opening-up" effect. 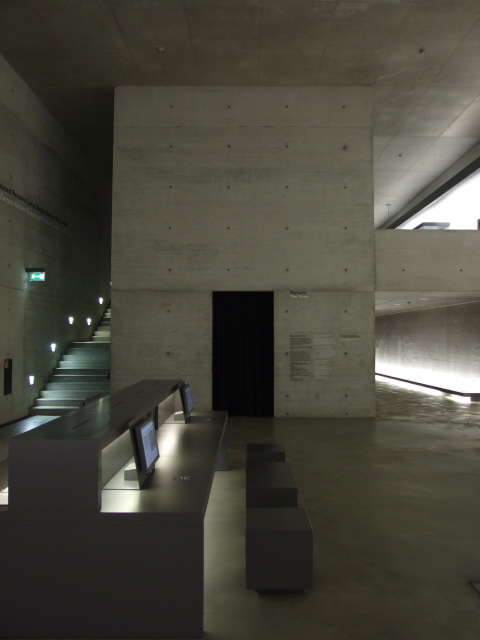 Incidentally, this element of the design vaguely reminded me of a similar, even more pronounced effect at the end of the new museum at Yad Vashem … whether this similarity was intended, i.e. whether there is any deliberate connection between the two designs, I cannot say, however. The various elements of the exhibition as such also follow an almost enthrallingly clear and symmetrical pattern in the main hall. Along the wall to the left stand a series of video stations, placed at equal distances from each other. Parallel to this are placed square blocks to sit on and with headphones set into them for the soundtracks of what's shown on those screens. Complementing these upright blocks are equally square hollows in the floor covered by glass. 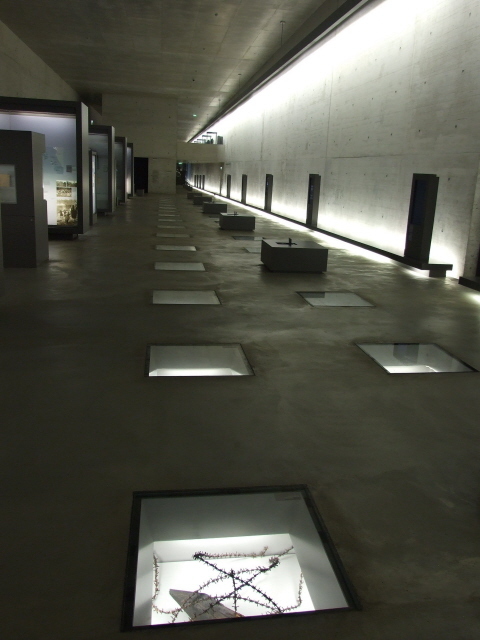 Inside, various artefacts excavated from the camp's grounds are displayed. You can only see them from above as you get near them – so they don't distract from the clarity of the straight lines and right angles dominating the interior design layout viewed as a whole. The right-hand half of the room is subdivided by tall, bookcase-like illuminated display cabinets, again all of equal size and positioned at totally regular intervals. 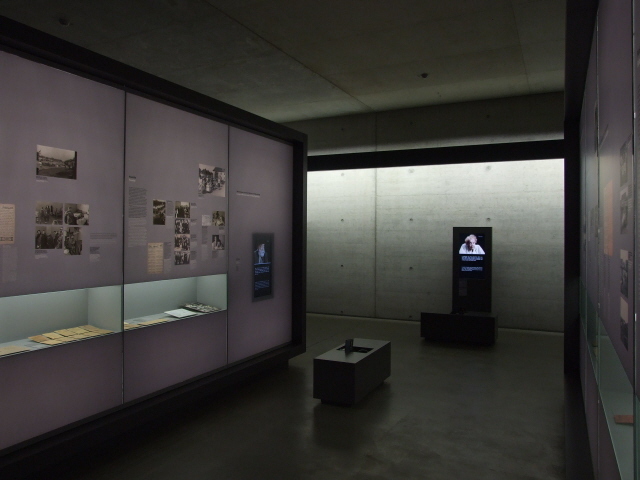 As for the content of the exhibition, this is organized thematically in a chronological fashion, from the beginnings of the camp as a POW detention centre, via its phases as a concentration camp, the camp's liberation, its use as a camp for displaced persons after WWII, and finally the prosecution of the perpetrators. All this is illustrated through a carefully balanced mix of documents, texts, photos, real or reconstructed artefacts (all also labelled in English) – and audio-visuals. The latter are particularly remarkable – esp. those interviews with survivors, which individualize the whole topic in a way that no other format could. The recordings are all original, i.e. in a variety of languages, depending on the respective interviewees' origins and languages – but they all have subtitles in German and English (for that reason the screens are tilted by 90 degrees so that all three sections – picture, German text, English text – fit onto the screen on top of each other). Thus you could always choose to follow the contents of the interviews without sound if you so wish. The sound is provided by headphones only – thus avoiding the sonic overlap that you often find in other museums and documentation centres around the world. I find it highly commendable that the designers of the Bergen-Belsen exhibition avoided this often quite distracting effect! Silence is so much more in keeping with a site such as this than simultaneous chatter. In the centre of the exhibition is the exhibition's cinema room, what they call a "Film Tower" here ... basically since it extends vertically over both floors of the building. The room inside is separated from the main exhibition by thick curtains, which makes it, too, nearly soundproof from the outside. Inside two films are shown in an alternating loop, one is silent and has been edited from the footage taken by the British Army from 16 April – this is accompanied to the left by a separate projection of still photos of the cameramen's notes, the important sections of which are highlighted. The other film, with sound, has been edited from British Movietone News material shot at Belsen on 23 and 24 April 1945. Both have been supplied by the Imperial War Museum in London. The second film is particularly captivating because it features not only victims but also perpetrators who were made to stand in front of piles of corpses and state their name, rank and age. It's especially chilling to look them in the eye, as it were, in this way – exposed to the undeniable evidence of their evil doings … Other sections of the film show the perpetrators being taunted by liberated victims – and at work carrying the dead to the mass graves … these are the bits that the note outside the cinema must mean when it says that parts of the material are not suitable for children under 14 years of age. Outside the "Film Tower" there is a computer corner – here visitors can delve even deeper into the subject matter. However, currently (as of late 2009), the material at these computer workstations is available in German only. An English version is said to be planned for the future. The exhibition continues and finishes upstairs with sections about the times after the camp's liberation and the prosecution of perpetrators. The fact that this section is upstairs, i.e. located above/higher than the sections about the grimmer parts of the site's history is presumably symbolic … (well, it is to me, even if it is not deliberate). Back on the ground floor, there's an information point , which has various leaflets about the site, including English-language versions, and a large bookstore. In this a wide range of material about Bergen-Belsen and related subjects is on offer. For obvious enough reasons, Anne Frank's diary as well as books about her are well represented. Much rarer material is also available – such as a 1995 issue of the "After the Battle" topical magazine (No. 89), which features an exceptionally long (26 pages) and graphically illustrated section about Belsen and its liberation. The documentation centre's own publication, its Guide to the new documentation centre exhibition, issued in 2007 to coincide with the opening of the new centre, is also worth mentioning. An English version is also available. 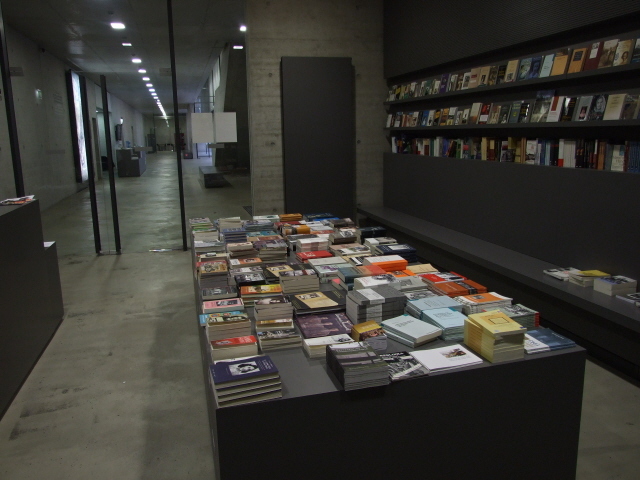 It is, like the exhibition's texts themselves, well translated – and at 4EUR reasonably priced. Parallel to the new documentation centre the so-called "Stony Path" leads along equally bare, polished concrete walls out into the open grounds of the former camp (see above). In it, there's another more recent and rather modern addition, called "Haus der Stille", 'house of silence' – this is basically a bare chapel-like memorial room. It's located near the Jewish memorial in the western section of the grounds. The location of the former camp's main gate lies to the north-east of the compound and can be seen from the road leading past it. It is marked by a red-and-white barrier. A bit further away, a new memorial and an old cattle car, as it was used for transporting POWs and concentration camp inmates, have been set up by the old railway sidings for the Bergen-Belsen camp. 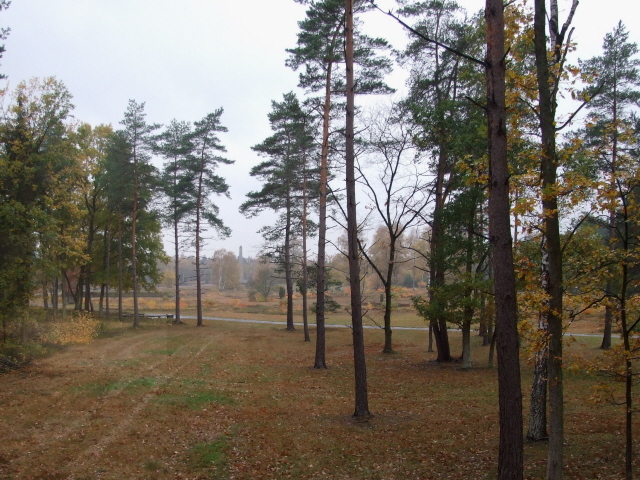 The site is located off the road about halfway between Bergen and the Belsen memorial site. From a small car park a path leads to the sidings and the memorials (be careful not to stray from the public paths – this area is still restricted by the military). 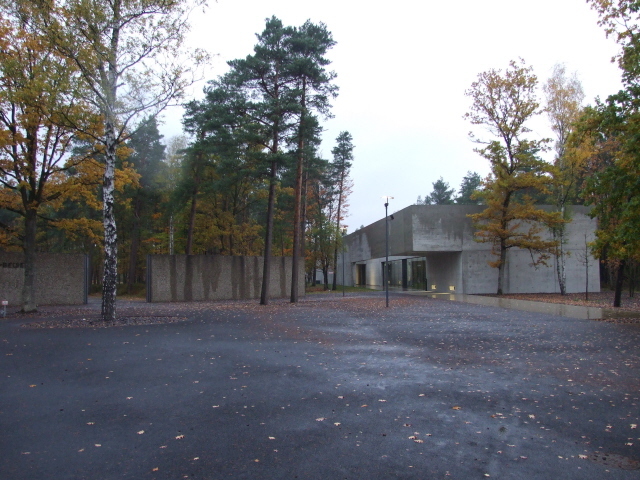 Back at Belsen itself, an education centre and a library complement the public exhibition and memorial ground. For use of the library, prior appointment is required. Location: in the eastern central part of Lower Saxony, Germany, about 60 miles (100 km) south of Hamburg, 12 miles (20 km) north of Celle, and about 5 miles (8 km) south of the small town of Bergen. Access and costs: remote and very difficult to get to without a car; free. Details: in theory you can get to the Bergen-Belsen memorial site by public transport but it's not recommended. 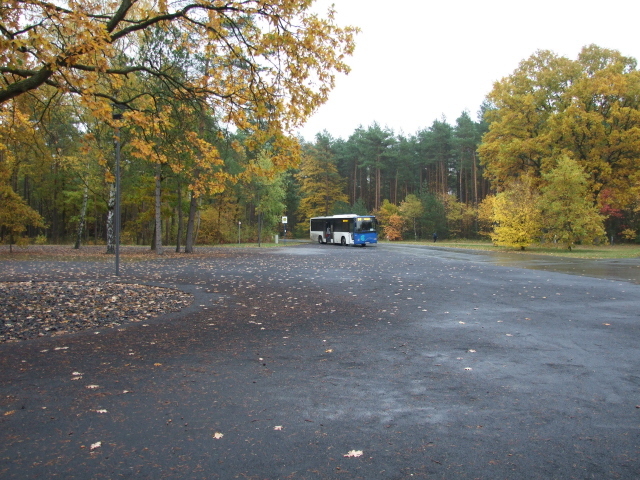 If you have to, you can get buses from the train station in Celle, first to the small town of Bergen itself, then to "Belsen Gedenkstätte" (usually line 0-11 from Bergen Langestraße) – the journey can take an hour, even over two hours depending on the connections. And only a few connections a day are available, on weekdays, even fewer on Saturdays, and none on Sundays. Try working it out on www.cebus-celle.de/frameset.html (first click "Fahrplanauskunft", then the little Union Jack at the bottom to get to the English version, then click "journey planner", type Celle into the departure box and "Bahnhof" to specify the stop; in the destination box put in or select "Bergen (b Celle)" and as the stop "Gedenkstaette", then click submit … and good luck!) When going there by public transport, best start early in the day and make absolutely sure you know your return departure times and don't miss the last bus back – you definitely do not want to get stranded out here in the middle of nowhere! It's much easier to get there by car – the "Gedenkstätte Bergen-Belsen" is signposted from the motorway (A7) between Hamburg and Hanover, the closest exit is No. 45 "Soltau Süd", from there take the No. 3 trunk road south towards Bergen and Celle. In Bergen turn right onto the 298 towards Bergen-Hohne and Winsen (Aller). Drive along the eastern edge of the NATO training grounds. The car park for the memorial pops up suddenly to the right in the middle of the forest after about five miles (8 km) from Bergen. Time required: you could spend a whole day if not more in the documentation centre alone if you tried to take in all the information that is available. Most visitors will want to be somewhat more selective, but something like three hours should be allocated as the absolute minimum, preferably more, esp. if you also want to walk the sprawling (though largely empty) grounds of the former camp. Combinations with other dark destinations: thematically linked and not too far from Belsen is the site of the Sandbostel POW camp, which stands out vis-à-vis Bergen-Belsen in that it has what Belsen lacks: original buildings, in fact a whole ensemble of original barracks, both wooden and brick, accompanied by a much smaller and far less high-tech but still worthwhile documentation centre. 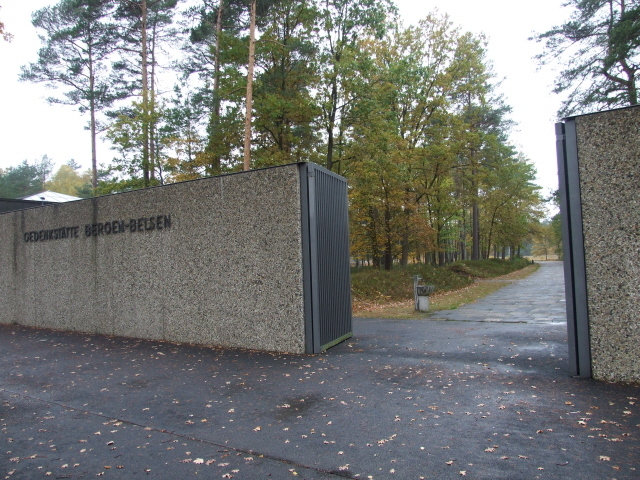 Especially those who find Belsen a little too abstract and distanced from its past visually will find that Sandbostel complements the memorial site of Belsen excellently. It's located ca. 60 miles (100 km) to the north-west of Bergen-Belsen near Bremervörde. Some 15 miles (25 km) east of Belsen lies Eschede – site of one of the worst train disasters ever (and by far the worst in German history), when in 1998 a high-speed passenger train derailed and crashed into a concrete bridge, killing over a hundred and severely injuring many more. 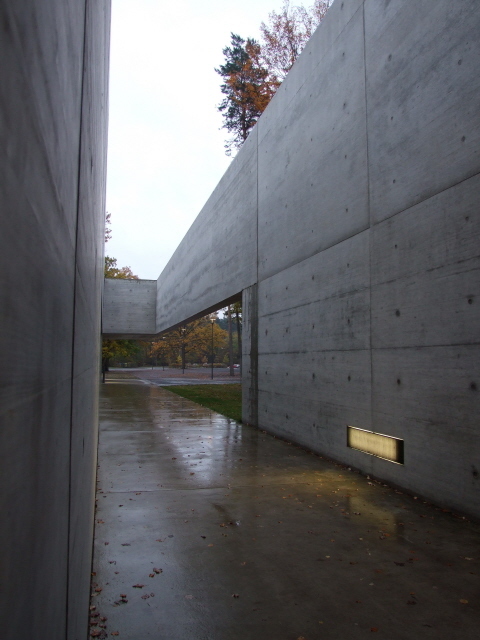 A memorial, consisting of an arboretum, with a tree planted for every one of the dead),and concrete monuments, directly at the site commemorates this tragic modern-day disaster. Other dark destinations in the wider vicinity (none are really close) include the Bunker Valentin near Bremen to the north-west, or some of the various border museums to the east. And, of course, Hamburg, ca. 60 miles (100 km) to the north, is one of Germany's dark (as well as general) tourism hubs (second only to Berlin). In particular the site of the largest and most deadly of the concentration camps in northern Germany, Neuengamme on the edge of Hamburg, should be of particular interest to visitors of Bergen-Belsen. Combinations with non-dark destinations: The region that Bergen-Belsen lies in is not Germany's most prominent tourist area, esp. not amongst foreign visitors, but it does have its own charms to offer for some. The Lüneburger Heide heathlands attract a sizeable number of tourists, and the nearby town of Celle, the southern gateway to the Lüneburger Heide (with Lüneburg itself being the northern gateway) sports a pretty old town core of picture-book half-timbered houses. Those who prefer larger towns or cities could go to Hanover a bit further south, but should better head further out to either the Hanseatic city of Bremen to the north-west or go the whole hog and travel north to Hamburg, northern Germany's outstanding metropolis.